As per an official source, NTPC Ltd., on Friday, has started generating power from our country’s biggest floating solar plant, located at Kayamkulam in the state of Kerala. NTPC Ltd., formerly known as National Thermal Power Corporation Limited, is an Indian public sector undertaking. It is mainly responsible for generating electricity and other similar activities. The 100kWp floating solar power generation plant is by far the largest floating platform found in India. This plant was brought in as a part of the ‘Make In India’ campaign at the Rajiv Gandhi Combined Cycle Power Plant (RGCCPP) in the district of Kayamkulam in the state of Kerala, the company officials said in a statement. The method through which the solar panels are incorporated is quite interesting as a matter of fact. The solar power generating panels are mounted on floating boards. It is these boards that keep the panels in place. Some of the benefits of these floating solar panels are – firstly, they save a lot of land space and secondly, they are much more efficient than those installed on land. 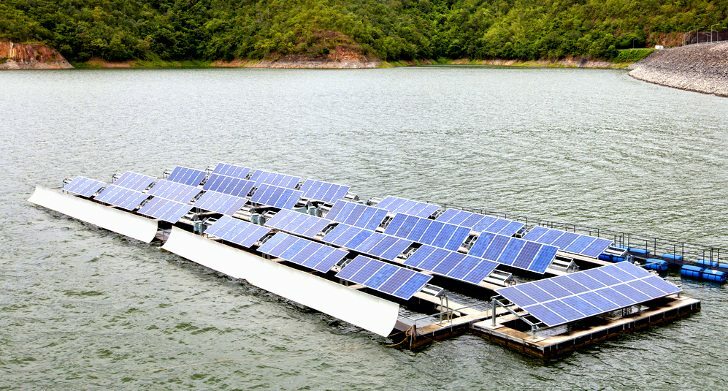 The floating solar platform was developed indigenously by NTPC Energy Technology Research Alliance, the Research and Development arm of NTPC Limited in partnership with the Central Institute of Plastic Engineering and Technology (CIPET) in the city Chennai. A patent has been submitted for the same. The solar panel system was mounted by Swelect Energy Systems Limited, Chennai with help from NTPC and NETRA Kayamkulam station. This was all done in a short period of 22 days. These floating solar power panels could be mounted in environments like saline water as well. The installation potential of these types of floating solar panel systems in India is humongous. The main reason for it is the abundance of water bodies across the country. Within the NTPC, the potential is somewhere around 800 Megawatts in several reservoirs of the existing platform. Kerala, in particular, is an excellent spot due to the abundant availability of water and lack of sufficient land. As of now, NTPC is working on getting such systems on a large scale installation.